NECKLACE - SARAH COVENTRY. "INTERLUDE" FROM 1977. 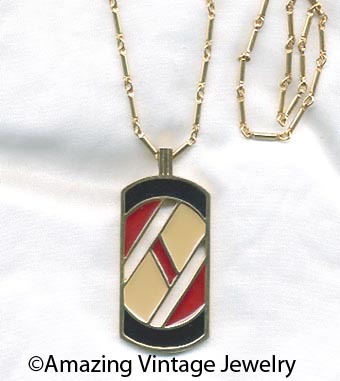 HUGE GOLDTONE AND ENAMEL PENDANT WITH A PRETTY EARTH-TONED GEOMETRIC DESIGN - A PIECE THAT IS UNIQUELY 70'S IN APPEAL. PENDANT IS A WHOPPING 2 7/8" LONG, 1 1/4" ACROSS. CHAIN IS ABOUT 27" LONG. VERY GOOD CONDITION.